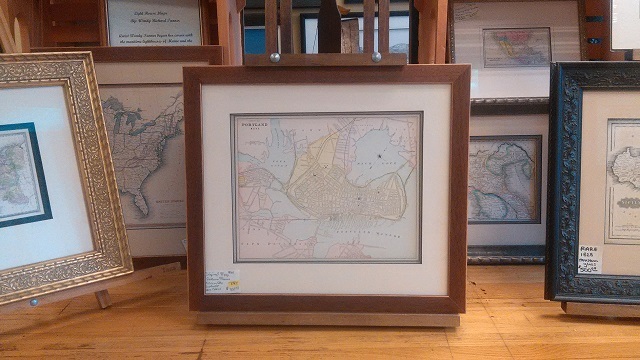 No matter your framing needs, at Mainely Maps, Frames & Gallery we can accommodate you with professionalism and speed. Browse our massive selection of handcrafted Larson Juhl frames. We use the correct glass to frame works on paper, plexiglass or UV coated, museum quality only. Our staff seeks the best way to care for new frames. (Cleaning may remove gold leaf or frame finishes). Matting artwork adds depth or texture to your piece, noting the differences between matting techniques such as over matting or float mounting. Archival framing uses various papers, pastes, pressure sensitive tapes to preserve artwork integrity. We consider environment: sunlight, humidity, heat. Let our Custom Framer Assist You With All Your Framing Needs. 1. Which frames best enhance the beauty and impact of the artwork and complement your decor & personal taste. 2. Using the correct glass for framing works on paper – the differences between Plexiglas, UV coated & museum quality glasses. 3. The best way to care for new frames as cleaning products often remove gold leaf or frame finishes. 4. Matting artwork to add depth or texture to your piece,the differences between matting techniques such as over matting or float mounting. 5. Archival framing – different papers, pastes, and pressure and sensitive tapes used to preserve the integrity of the artwork. 6. Considerating environmental issues: direct sunlight, humidity, heat, etc.